This example shows how to create the MViewPane JavaBean component and embed it in a Swing Container component. 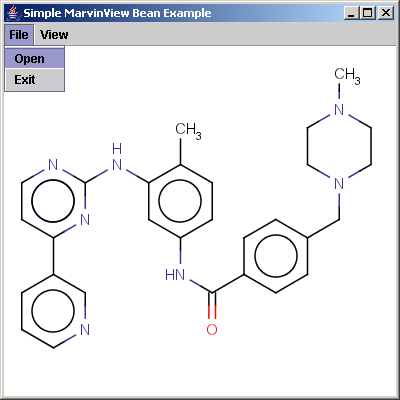 This example demonstrates loading molecules from files by creating a File > Open menu. This image is a snapshot of ViewSimple.java in use. The major part of this code is shown below. In case a multi-molecule file is opened with this method, it is considered to be an animation, or molecular dynamics simulation, and the structures will be shown one after another. However it is more common to have multi-molecule files containing molecules without such a relation. These molecules are typically shown in a table. The View Table example shows how to create a table with multiple cells.